Editor’s Note: This is the second in a four part series of articles examining the development of Russia under Putin. Click here to read the first installation. It was raining in Dresden, East Germany the night the wall fell. While a little over 100 miles away, joyful Berliners gathered in the streets, Lt. Colonel Vladimir Vladimirovich Putin was facing a very different sort of crowd. After years of oppressive rule, and finding themselves in the midst of a power vacuum, the citizens of Dresden began to march on the local Russian Intelligence Headquarters. Inside the walls of the compound, while torching thousands of sensitive KGB files, Putin was desperately trying to get the higher-ups in Moscow on the phone. When he finally managed to get through, the message was clear. Putin was on his own. Feeling a deep sense of betrayal, Putin walked out to the crowd and bluffed. He told the gathering that just inside the doors of the compound were armed guards ready to fire upon the crowd unless they dispersed immediately. Miraculously, the lie worked, and the mob was soon gone. However, the incident would mark a turning point in Putin’s life and would leave him determined not to allow himself be put in a situation where they would be forced to operate from a position of weakness. Vladimir Putin was born on October 7, 1952 in Leningrad, now St. Petersburg, during the early days of the Cold War. From a young age, Putin was determined to become an intelligence officer and emulate the spies he saw in the soviet state movies. Putin would eventually go on to attended St. Petersburg State University where he received a law degree. After graduation, Putin enlisted in the KGB and served as a counterintelligence officer. After the Soviets pulled out of East Germany, Putin would returned to his hometown, St. Petersburg, where he finished out his time in the KGB and assumed his first political position as the city’s Deputy Mayor. The Russia that Putin returned to after his time in Germany was in the throes of President Boris Yeltsin’s “macroeconomic stabilization.” The stabilization efforts involved a series of harsh austerity measures designed to control inflation. Interest rates were raised to unprecedented levels to help tighten money and restrict credit, new taxes were implemented, and steep cuts were made to subsidies and welfare spending in an attempt to bring the national budget into balance. But instead of turning the Russian economy into a democratic-capitalist paradise, the measures pushed the country into a deep depression. To try and offset this economic downturn the Yeltsin Government undertook a policy of privatization selling off nearly 45,000 businesses that had been previously owned by the government. However, as with nearly everything the Yeltsin Government did, things didn’t quite go according to plan. Instead of the industries being bought out by an expansive and diverse group of shareholders, which was intended to kick-started a new Russian middle class, the firms fell into the hands of a few opportunistic men known as the Oligarchs. These Oligarchs would help to propel Putin’s political career. While serving as Deputy Mayor, Putin was able to gain favor by allowing them to skirt around anti-monopoly laws and denying government licenses to their competition. This network of powerful allies helped Putin to expand his influence within St. Petersburg and, eventually, helped land him a job in Moscow as the Director of the Russian Federal Security Service (FSB). While little is known about Putin’s time at the head of Russia’s foremost intelligence agency, his tenure with the agency was short. Within a year of taking over the position, Putin’s benefactors helped to secure him to secure a new position, Prime Minister of Russia. In August of 1999, while Putin was still head of the FSB, Boris Yeltsin’s government was in shambles. Corruption, a sluggish economy, and declining personal health had caused Yeltsin to lose control of the country. In an attempt to correct course, the Russian President fired and replaced his Prime Minister and the entire cabinet (for the fifth time). Boris Yeltsin chose the then Director of the Russian Federal Security Service Vladimir Putin to serve as Prime Minister. The choice of Putin was unusual given his low political profile and relative inexperience. However, from the start, Putin used his newly acquired position to his advantage, by becoming the new face of Russian Nationalism while keeping his eye on the Presidency. With Yeltsin’s credibility in a free fall, Putin worked to become the new face of Russian nationalism. This was most clearly demonstrated in his handling of the Second Chechen War. In 1994, after the fall of the Soviet Union, leaders in Chechnya seized the opportunity to declare themselves an independent nation. While many in Chechnya supported the move, ethnic Ingush and Russians were less than thrilled. 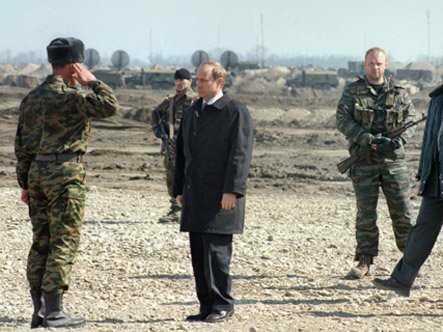 A small scale civil war ensued, and Russia used the skirmish as an excuse to invade Chechnya to “restore constitutional order.” Two years of brutal fighting followed in which an estimated 100,000 people died before a ceasefire agreement was reached and Russian troops were withdrawn. Despite the truce, tensions continued to simmer. Chechnya began to descend into chaos as its infant government struggled to rebuild the region. Soon the government began to break down and become overrun by local warlords. The chaos, compounding with an invasion into Dagestan, led to a break in the fragile peace. Back in Moscow, Putin was designated as the point man for handling the conflict and quickly used it to his advantage. Putin adopted an unrelenting, scorched earth strategy which employed massive air strikes combined with ignoring civilian casualties. Putin also began to appear on TV preaching a vision of a stronger and united Russia. He staged photo ops of him riding in fighter jets and on the frontlines of the war. The images helped to enhance Putin’s image at home, and separated him from the incompetence of the Yeltsin administration. Four months after appointing Putin as his Prime Minister, Boris Yeltsin resigned his position as President, clearing the way for Putin to take over. Putin’s rise to power was a quick as it was unexpected. In less than a decade, Putin managed to move from a position of a faceless government bureaucrat to the President of Russia. While at first glance this remarkable rise to power could be seen as chance or good luck, it was the result of meticulous planning and cold political calculations. In the next article, we will exam Putin’s Russia today and analyze how the tactics used in his early years are still keeping his regime in power today. Previous Previous post: Why do cities pay for stadiums?